Opting for healthier choices while dining out usually means going for a salad or lighter meat dishes like salmon and chicken. But what if you want to get your carbohydrate fix or are craving for local dishes? Change is already on the way if you desire greater variety or crave for something more robust in flavours. The addition of more wholegrain options, such as brown rice and wholemeal bread to our daily diets, has been a topic of national discussion, ever since Prime Minister Lee Hsien Loong raised it in his 2017 National Day rally speech. After all, consumption of refined grains which are usually higher in glycemic index, such as white bread and white rice, could increase the risk of diabetes. While many were initially sceptical about the long-term feasibility of such eating habits, a small but growing group of hawker stalls, traditional restaurants and even fast-food joints, is leading the charge in changing mindsets. Many of them are under Health Promotion Board's (HPB) Healthier Dining Programme, which aims to encourage food and beverage businesses to provide healthier food and drink options to diners. Nasi Padang restaurant Rumah Makan Minang is one of the first to lead the change. In July, it introduced red rice in five dishes, including rendang, fishball soup and assam pedas, on its menu to draw health-conscious customers. Red rice is a type of wholegrain rice that contains a similar amount of fibre as brown rice, but with twice the amount of iron and six times the amount of zinc. McDonald’s is also on board; the fast-food giant added Red Rice Porridge to its breakfast menu in April to good reviews. It explained that Singaporeans have become increasingly receptive to wholegrain food items and it was relevant for the company to evolve with these needs. To help drive interest in wholegrains, there are campaigns such as HPB’s Wholegrain Wednesday, which encourages consumers to opt for wholegrain dishes on Wednesdays. In its latest instance of the campaign on Sept 5, HPB conducted a Spin-The-Wheel activation at Tan Tock Seng Hospital’s (TTSH) Kopitiam food court to reward customers with a sure-win spin for every purchase of a wholegrain meal. Consumers can continue to enjoy a variety of wholegrain options offered at TTSH’s Kopitiam food court every Wednesday till February 2019. Public response has been encouraging so far. At Rumah Makan Minang, a small but growing group of diners will “automatically choose red rice instead of white rice”, while others are willing to make the switch with some prompting, says Muhamad Hazmi Mohamad Zin. The restaurant is now looking to add wholegrain noodles to its menu. Almost 60 per cent of Yu Kee’s customers have also replaced regular mee kia with wholegrain mee kia, according to its spokesman. McDonald’s’ Red Rice Porridge has been particularly popular among health-conscious female customers. Mr Mohamed Shafir, 35, owner of Dapur Bonda Khadijah, a nasi padang stall at Berseh Food Centre, is also encouraging his customers to opt for brown rice instead of the usual white rice. He even takes the initiative to send a packet of complimentary brown rice to customers with high blood pressure and diabetes, in hopes that they will make the switch. More than half of the stall’s customers now choose brown rice over white rice. For diners like banker Gwen Lin, 30, who used to depend on more expensive Western options for a healthier lunch, the convenience of having wholegrain options at local eateries is much welcomed. “It’s great that I can now have my favourite local dishes, without feeling too guilty about it, or having to suffer from a post-lunch food coma,” she says. Mooncake festival is around the corner. 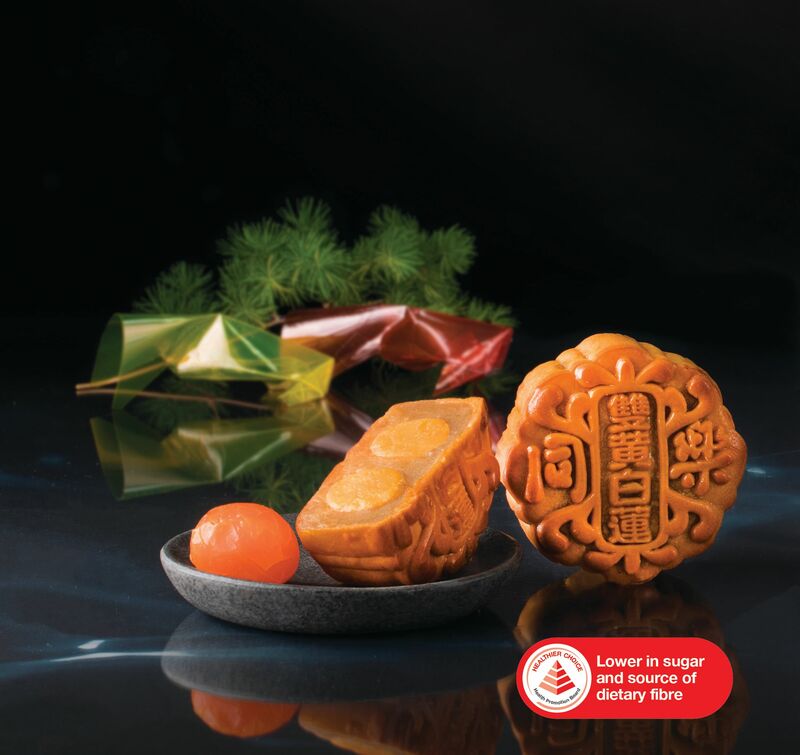 Treat yourself to healthier mooncakes from Tung Lok that are lower in sugar, but still high in flavour. The mooncakes are partially sweetened by allulose (a form of functional sugar) that results in up to 25 per cent less sugar and calories compared to conventional options. Choose from an assortment of flavours such as the classic double yolk white lotus mooncake to a more contemporary melon seeds with red lotus. Available at TungLok restaurants, Fairprice Xpress, Cheers at Esso Stations, and selected Cheers stores from now until 24 September 2018; as well as at Takashimaya Square, B2, till 24 September 2018. Others may take more time to embrace the wholegrain alternative, but are open to change. With more local eateries joining the wholegrain movement, reaping the benefits of healthier eating will be easier than ever. Till Oct 26, earn rewards such as food and beverage, and shopping, vouchers, when you choose healthier options such as wholegrains in the Eat, Drink, Shop Healthy Challenge. Visit gethealthy.sg/eatdrinkshop for more information. Look out also for other wholegrain promotions at hawker centres at gethealthy.sg/calories. Check out the first story of our healthier eating series on smarter cooking options at home here. In collaboration with Health Promotion Board.